∙ Shoe storage bench hand-crafted in solid Oak. ∙ Sturdy bench seat with footwear storage beneath. 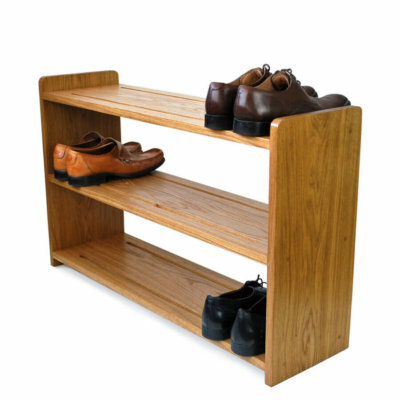 ∙ Available with 1 or 2 shoe shelves in a variety of widths. 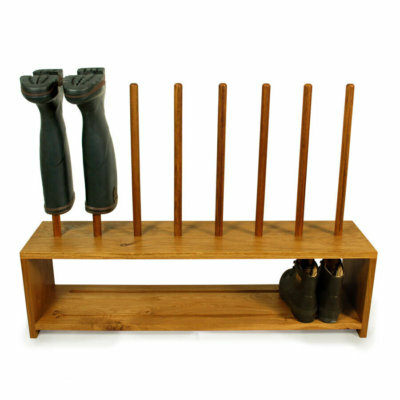 ∙ Slotted shoe shelves allows dirt to fall through. ∙ Generously proportioned for large footwear. Two products in one and an elegant, standalone piece of furniture to boot. A sturdy bench seat gives home to one or two slotted shelves of footwear storage beneath. Our Oak Shoe Bench is designed and handmade with care, here at the Boot & Saw workshop in Cornwall, using only the finest quality solid European Oak. 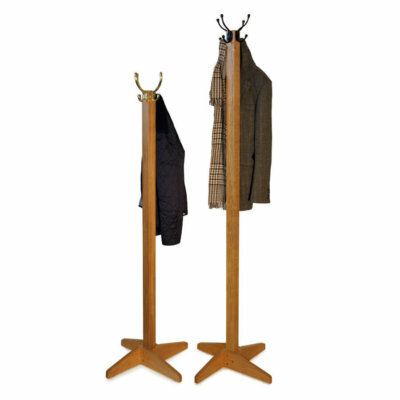 Generously proportioned to store everything from your favourite shoes to chunky walking boots too. Elegant in its simplicity, our Shoe Bench is the perfect addition to your boot room and slim enough to fit in a hallway with a range of sizes to suit almost any space. Simple adjustable feet prevent wobble on uneven floors. Supplied oiled, ready assembled and finished to the highest standard, you can be sure your Shoe Bench will last a lifetime. Designed and hand crafted in house, each Oak Shoe Bench is hand-made using sustainably sourced timber from managed forests. We use European Oak, which naturally features a beautiful colour and grain and, unlike American Oak, doesn’t have to be shipped from across the World. A robust and durable hardwood, compared to softwoods and man-made materials, Oak stands up better to daily wear and tear. If you want the best available, Oak is it. Our Oak Shoe Benches are oiled with Osmo Polyx oil for a durable and hard wearing satin finish that brings out the natural colour of the wood. Osmo oil contains only natural ingredients and is quite simply the best finish on the market. Supplied ready assembled and ready to use out of the box, no assembly required. Simply unpack and add shoes. 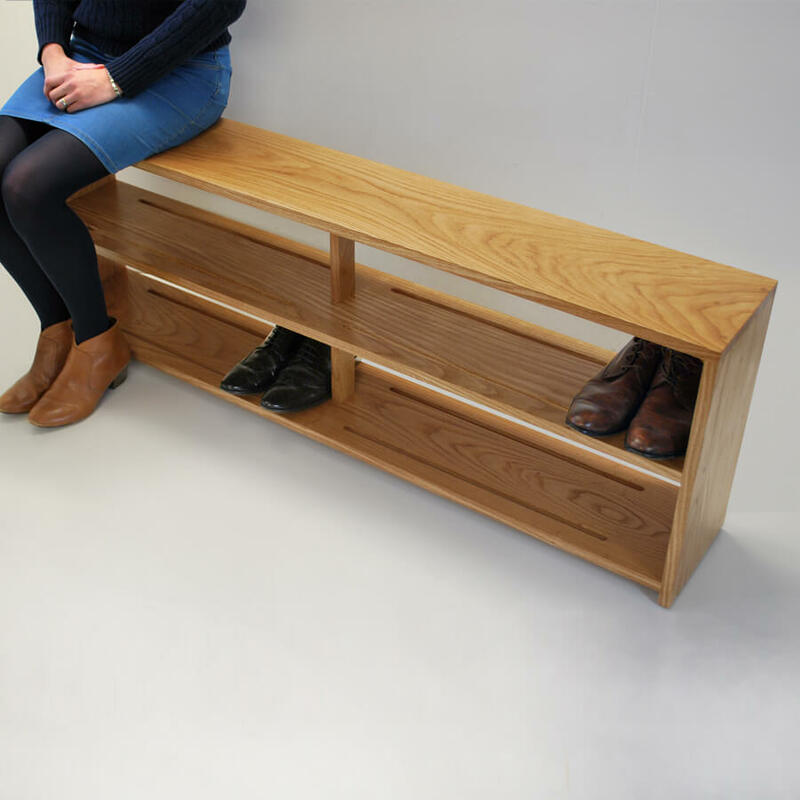 Our Oak Shoe Bench is available in a range of widths with one or two shoe shelves, but if you have a space that requires something bespoke, just drop us a line and we’ll be happy to help. We make everything to order so custom sized racks are no problem. The shoe bench we ordered arrived quickly and in perfect condition. The workmanship is excellent, it is more than a functional item it is a lovely piece of furniture which looks perfect in the Hall. Thank you very much, I would highly recommend this product and the company. So pleased with my shoe bench, the finish is amazing. Made to measure for the space in my porch, fits perfectly. Hand made in a few weeks and packaged really well for delivery. Very happy! Really pleased with this purchase, beautifully made. We were kept very well informed about dispatch and delivery times. Fantastic piece of furniture, beautifully made, craftmanship second to none, well worth the wait, Many Thanks its not easy to buy excellent quality products these days but this is the real thing. This is not just a shoe bench, it’s a beautiful piece of furniture of outstanding quality. Absolutely delighted with it. Must also comment on the excellent communication and amazing packaging. Would not hesitate to order from Boot&Saw in the future. Although there was a delay in our order being completed, Tristan was always very good at keeping us updated and offered to cancel the order if we were not satisfied. Completed benches were beautifully finished and very well packed for transport. Clear instructions were given to set up the benches. Excellent customer service with a friendly manner – nice to think you’re communicating with a human and not just a sales person! Great bench, beautiful quality. Customer service was excellent and I’ve never seen such a well packaged item before. Five stars all round,thank you. An excellent bench the quality of which we could not match elsewhere. Outstanding communication when I wished to change my order after having placed it. Beautiful piece of furniture, well made, and amazingly well packed. I couldn’t be happier! I am really pleased with my purchase. The shoe bench is beautifully made, functional and a lovely piece of furniture. Communication with Boot and Saw was excellent and they altered the depth so that it fits perfectly in the recess in my hall. The shoe bench was very well packaged and in perfect condition. It is a lovely piece of furniture and really is too nice to place mucky shoes on. But I look forward to using it anyway! A stunning piece of furniture that fitted perfectly in our home. Great polite and friendly service too. Absolutely perfect, the craftsmanship is obvious and the result is a functional and handsome piece of furniture. Well worth waiting for – I have two in a corner arrangement and they have completely transformed our hallway. A really nice functional piece of furniture,well finished and perfectly fitting the purpose. Only drawback was that it didn’t get delivered on the due day due to a problem with the delivery company, but came next day once we contacted Boot & Saw. We love our bench and it lifts our heart every time we open the door to the porch! Beautifully made in quality oak with love and care (and packaged extremely carefully for transit). It can hold me (a “fully sized” adult, ahem) sitting down with no trouble at all. Thank you! A beautiful piece of furniture, you can tell it was made by someone who loves working with wood. also very well packaged. The Wellie Racks arrived in my hands this afternoon and they are absolutely beautiful. Thank you so, so much for making them for us. I suspect we may get some new interest for you from our other local Nurseries! Tristan – It’s beautiful, you’re a master craftsman my friend!! So so happy with it!